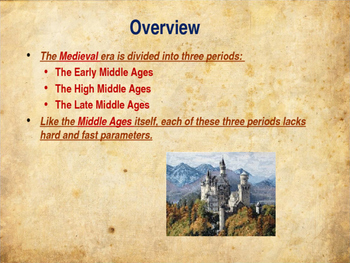 This is a 40 slide, highly animated, power point presentation on The Middle Ages; Early, High and Late Middle Ages. All the slides are editable so you can modify the slides if you need to. The presentation covers the Middle ages beginning in the 5th century to the mid 17th century. 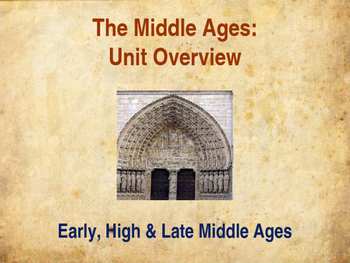 Each period is broken down as the Early Middle Ages, The High Middle Ages and the Late Middle Ages. The Early Middle Ages is sometimes still called the Dark Ages. This elegy originated with those who wanted to compare the earlier period unfavorably with their own so-called "enlightened" age. The term is still somewhat apt for the simple reason that we know relatively little about events and material culture in those times. This era is often considered to begin with the "fall of Rome" and end sometime in the 11th century. The High Medieval Era is the period of time that seems to typify the Middle Ages best. Usually beginning with the 11th century, to 1300.This period saw such significant events as Norman conquests in Britain and Sicily, the earlier Crusades, the Investiture Controversy, and the signing of the Magna Carta. The church became the universal and unifying institution. Strong popes, notably Gregory VII, worked for a reinvigorated Europe guided by a centralized church. By the end of the 11th century, nearly every corner of Europe had become Christianized (with the notable exception of much of Spain), and the Papacy, long established as a political force, was in constant struggle with some secular governments and alliance with others. The end of the Middle Ages can be characterized as a transformation from the medieval world to the early modern one. The time period was 1300-1650. The Great Famine occurred during 1315 to 1317 followed by the Black Death, severely reducing population of Europe. Religious unity was jolted by the differences between Western and Eastern Church. The period saw a rise in social unrest, serfs’ uprising, the Peasants’ Revolt. European powers also suffered the Hundred Years’ War between England and France. Western Schism decreased the influence of Catholic Church. 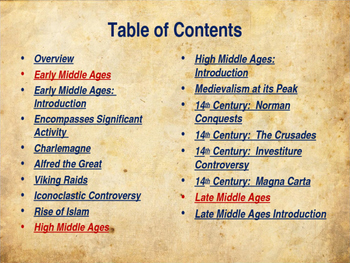 This is one of several power point presentations that I offer in my store on... the Middle Ages. 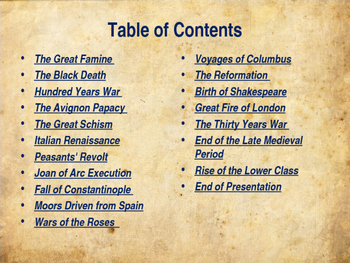 I also offer each one separately as well as individual presentations of the key figures and events of each period.